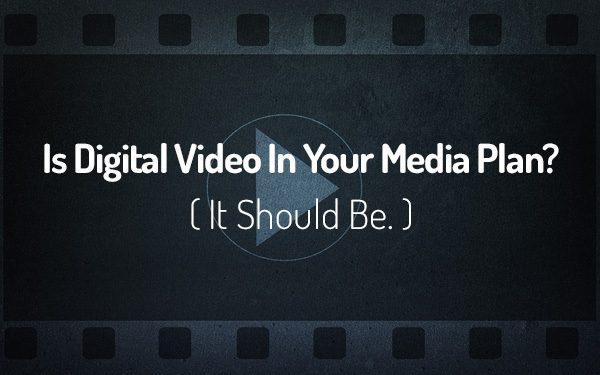 Is Digital Video In Your Media Plan? It Should Be. Apps like Periscope and integrations like Facebook Live have drastically changed the way users share content online. And marketers should follow suit. Digital video includes anything your brand shares online in a video format: video rich media ads, video social content, YouTube pre-roll, ads placed on TV streaming services and live streams — to name a few. Cisco projects that 75% of all mobile traffic will be video content by 2020. YouTube touts over one billion users; that’s one third of all Internet users. The video giant also reports that viewers consume over three billion hours of video content on the site each month. And, according to Forbes, 59% of executives would rather watch video than read text. There’s an obvious trend in consumer preference toward video content. As marketers, we should create a supply to meet that demand. According to the AOL 2015 US State of the Video Industry Report, over 30% of digital video budgets are dedicated to branded video. Traditional budgets are also being reallocated to digital video buys. In fact, over half of buyers are participating in this shift. The Interactive Advertising Bureau’s Video Ad Spend study estimates that number at closer to 72% of media buyers moving funds for TV spend to digital video. The study also reported that 68% of marketers and agency executives believe that digital video will be just as important as traditional broadcast advertising within the next five years. And, digital video spend has increased by 114% since 2014, with advertisers now spending upwards of $10 million each year on digital video. The industry as a whole has recognized the value of digital video content. Your brand should too, or else risk getting left behind. Based on data from Business Insider, click-through rates (CTR) for video ads average 1.84%, the highest CTR of all digital ad formats. According to Adobe’s Digital Index, smartphone video share grew 33% from 2014 to 2015. The Online Publisher’s Association reports that 80% of Internet users can recall a video ad they’ve seen within the past 30 days. Of that 80%, 26% searched for more information about the product, 22% visited a website named in the ad, 15% visited the company site featured in the ad and 12% made a purchase. The big takeaway here is that digital video content is compelling for consumers and effective for marketers. If you’re ready to revamp your media plan and integrate more original digital video content, get in touch with us.